On September 1, 2018, Europe placed a ban on halogen light bulbs, hoping to encourage citizens to purchase more energy efficient lighting. The ban was put in place to ensure a continual phase-out of halogen bulbs in hopes of selling more energy efficient and environmentally conscious LEDs. Retailers are allowed to sell their current stock of halogen bulbs but must replace those shelves with energy efficient lighting. 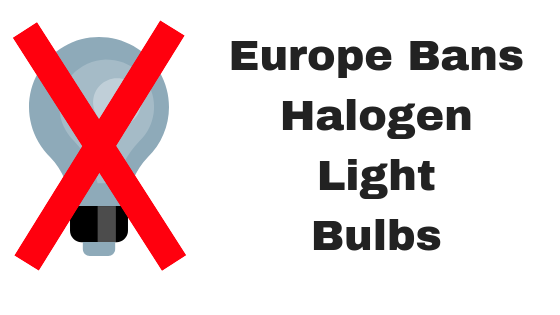 As it is with most traditional lighting, halogen bulbs are part of a chain releasing carbon dioxide into the air. These carbon emissions come from the power plants used to generate electricity to light our bulbs and, in turn, our homes and businesses. While renewable energy is becoming more common in terms of power generation, the majority of our power plants still utilize fossil fuels. As halogen bulbs require heat to produce light, they require much more energy to power than LEDs, which produce light electronically. This makes halogen light’s respective carbon footprint much larger. Traditional lighting remained popular for so long due to its familiarity and low cost when LEDs were just hitting the market. Now, LED prices are comparative to halogen and incandescent bulbs, and there are bulbs of every shape and size available! Plus, halogen bulbs use five times the energy of an LED and have a significantly shorter lifespan. LEDs run for 50,000+ hours and are cool to the touch. Over time, your LEDs will pay for themselves. Another added benefit of LED lighting is the variety of color temperatures, allowing you to create the perfect lighting for your space. No more dingy, orange/yellow hues! Find Halogen Replacements at Sitler’s! While the ban on halogen bulbs hasn’t made its way to the United States yet, this is a good example of when to jump on a bandwagon. Make the switch to LEDs today to save money and reduce your carbon footprint!